Hello there! I hope you’re having a great Monday. I’m just relaxing after having dinner, and thought now would be a good time to share a fabulously healthy – and incredibly tasty – snack with you all. A couple of weeks ago I was asked by the lovely Hannah if I’d be interested in trying out some tasty snacks. If you’ve been reading for a while you might know that I’ve been trying to include more recipe posts and easy snack ideas. Having a long term medical condition means sometimes it’s hard to ensure you’re eating well; on very painful days I’m extremely lethargic and the last thing I want to do is spend ages cooking, which is typical as excellent nutrition is just what’s needed on bad days! Most snacks are known for being fattening or high in salt/sugar, but these snacks are refreshingly different. 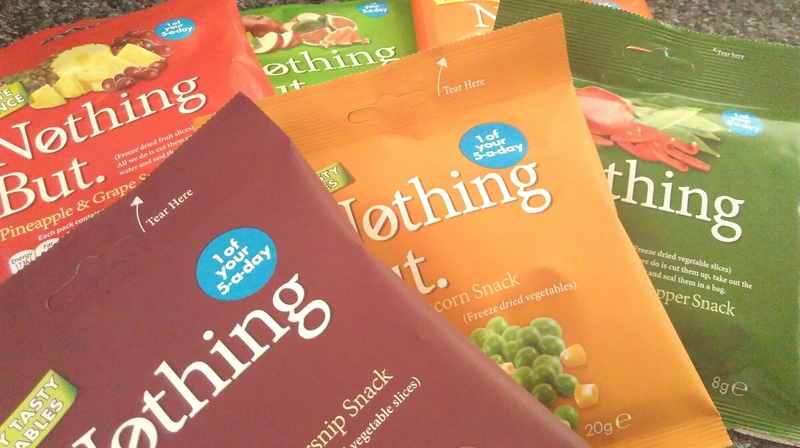 Nothing But are a range of snacks available in either fruit or vegetable combinations. 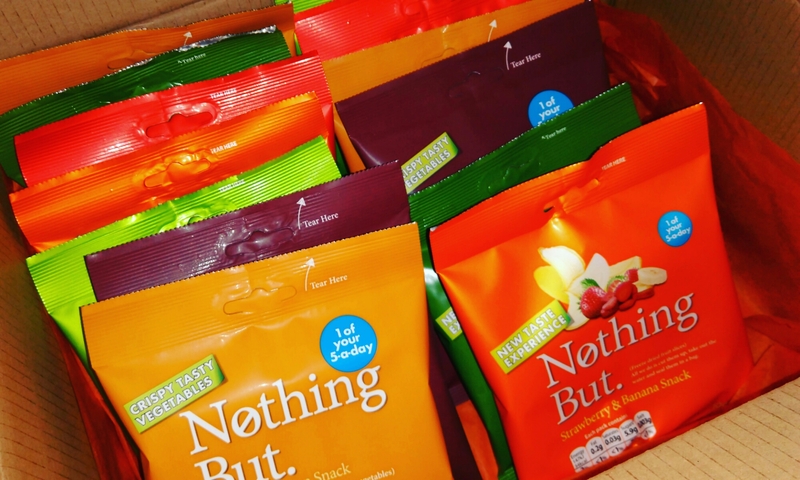 They’re simply fruit or vegetables…no added salts, sugars, fats, colours or preservatives. These sounded right up my street, and when I opened the box and saw plenty of brightly coloured packages I was keen to try them out. 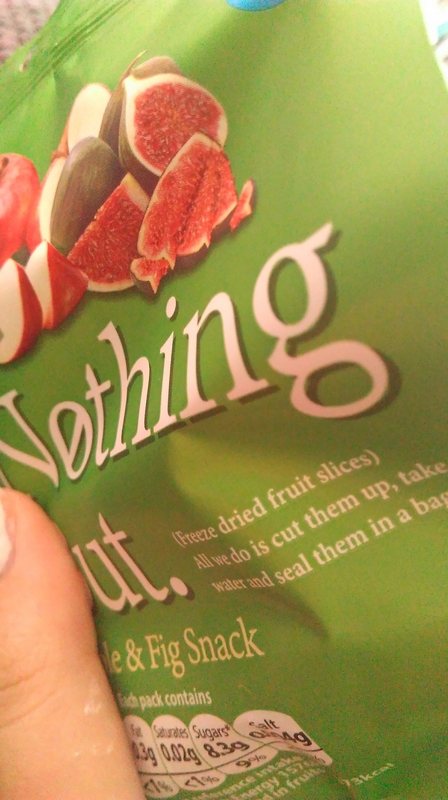 The fresh produce is taken by the lovely folks at Nothing But and then frozen, and the water evaporated. This leaves a product that is exceedingly tasty and full of natural flavours. Only ever two ingredients feature in each pack, and the flavour combinations are truly delicious. The vegetable ones are available in the combinations of: Parsnip & Beetroot, Pea & Sweetcorn and Red Pepper & Mangetout. 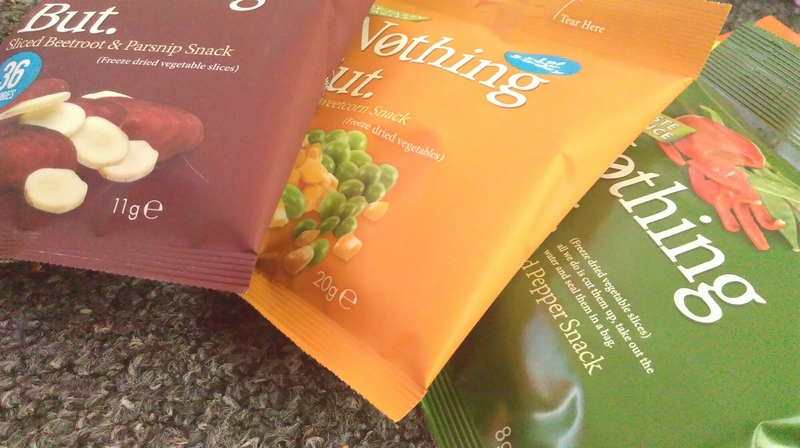 I was pleasantly surprised by the concentration of all-natural flavours in each bag; the process somehow intensifies each flavour, providing a tasty, natural snack that’s a lot easier to eat compared to their non-freeze dried equivalents! They’re crispy so provide that ever-so-satisfying crunch that we’re all looking for when eating a delicious snack. 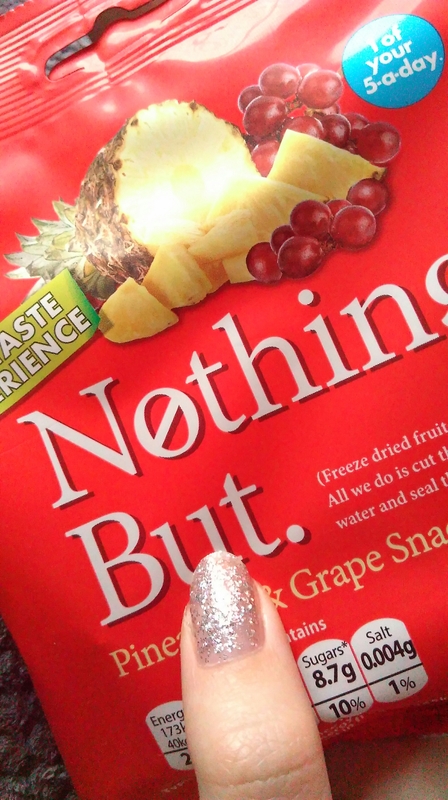 If you have a bit of a sweet tooth, you’ll love the above fruit snacks. These were incredibly tasty, including the following combinations of Apple & Fig, Pineapple & Grape and Strawberry & Banana. I had a packet of these with my breakfast and I was incredibly impressed! They were incredibly fruity and deliciously sweet, which is great if you’re after a healthy alternative to other sweet snacks. These snacks are prepared in the same way as the vegetable snacks, which produces a naturally sweet range of delicious snacks suitable for any time of the day. What is really fantastic about these is that each pack contributes to your 5 a day, providing a whole portion of your fruit/veg in each packet. Replacing those daily bags of crisps with a product like this would help you to meet this daily recommendation in no time! They’re also gluten free and suitable for vegetarians and vegans which is great if you have particular dietary requirements. 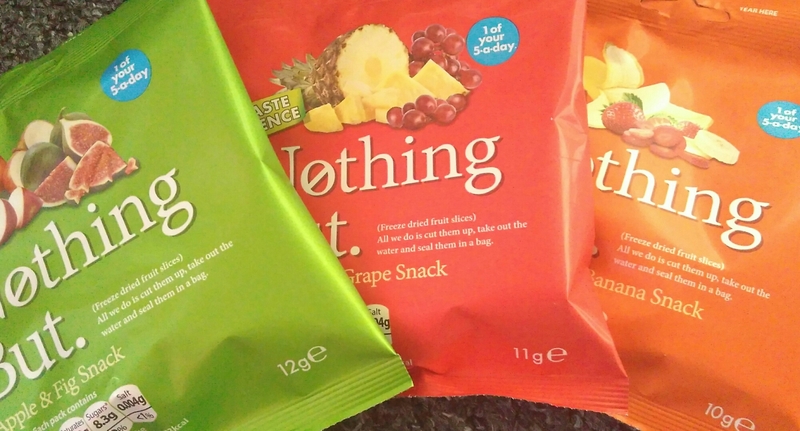 All in all I’m extremely impressed by these, and will definitely look at swapping my usual snacks with them. My personal favourites were the Red Pepper & Mangetout and the Strawberry & Banana. It’d be fantastic if these products could be bought on my university campus to stop me snacking on chocolate bars and crisps during the day. 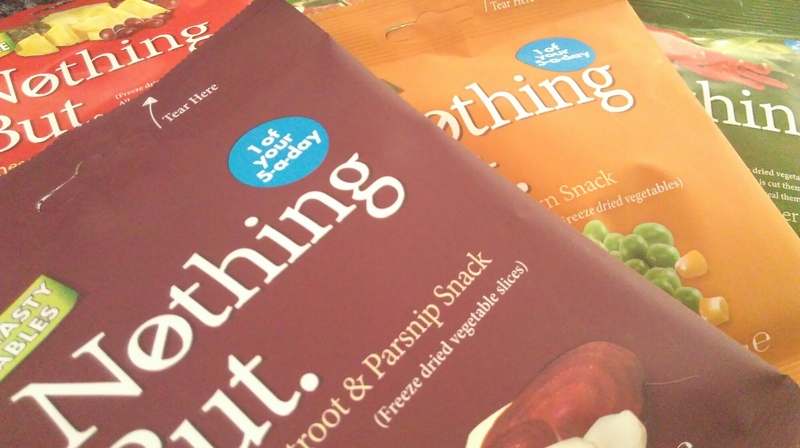 Thank you very much to Hannah and the wonderful team at Nothing But for sending these to review. Why not check out their website? I haven’t heard of this brand, but they sound delicious! I hadn’t before they got in touch, I really recommend them, they’re fabulous!